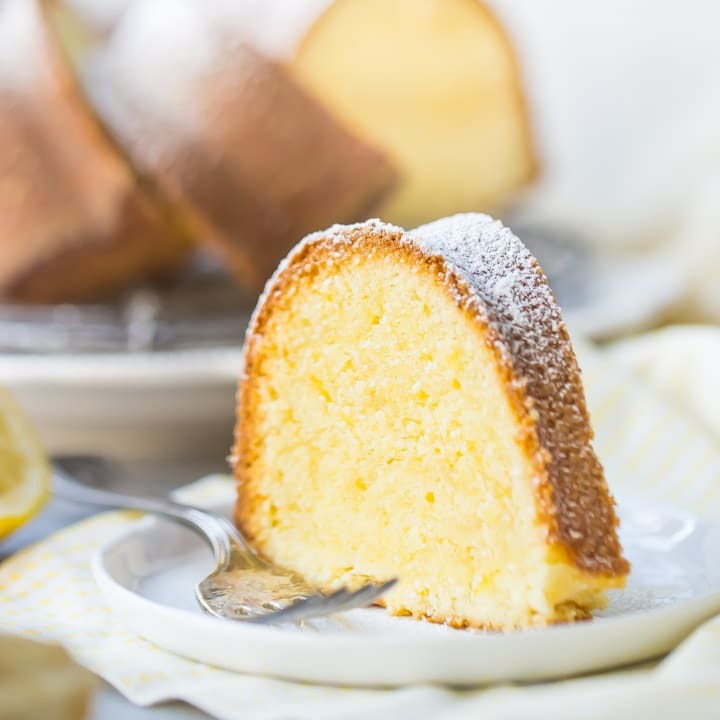 If you love lemon, you’ve gotta try this lemon pound cake recipe! Just bursting with tangy lemon flavor, and so moist! Made with all butter, for a velvety texture that practically melts in your mouth. Is that totally cliche if I talk about the weather? If so I’m sorry, but at this time of year it tends to be front of mind for me. I am just SO SICK of WINTER!!! Spring cannot get here soon enough for me. I’m craving bright, sunny flavors to get me through these last few weeks of bitter cold! This lemon pound cake is just what the doctor ordered! That last one is a biggie! There’s nothing that bugs me more than a dessert that doesn’t have flavor. Not an issue here, my friend. 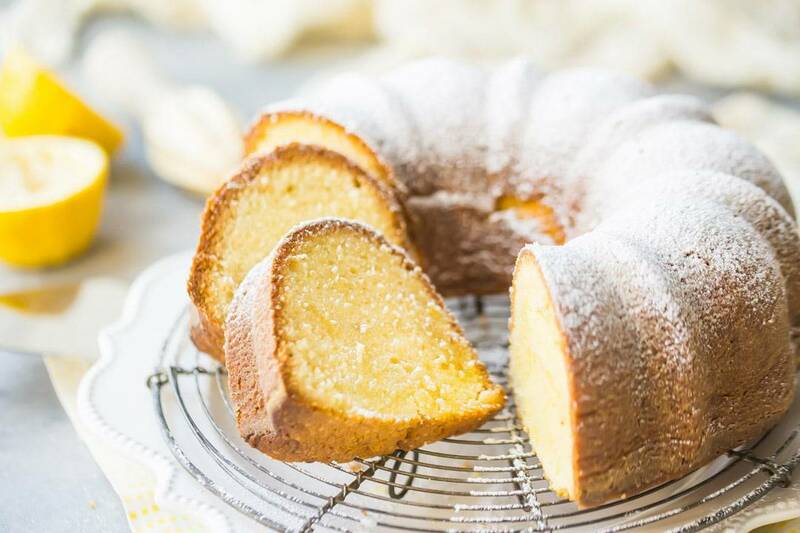 This lemon pound cake recipe is made with the zest and juice of two whole lemons! Plus there’s a little lemon extract in there too, just for good measure. There’s no mistaking that this is a lemon pound cake. So bright, tangy, and sunshine-y! And the “moist” and “buttery” are covered too. It’s made with all butter, which makes the recipe simple and straightforward, and makes the final cake so moist and velvety! I love it with just a light dusting of powdered sugar for garnish, but if you’d prefer it glazed, just stir 1 1/2 cups powdered sugar together with the juice of half a lemon. It’s a simple icing that will really bring out the citrus-y flavors! And if you’d like it jazzed up even more, think about topping it with fresh berries and whipped cream. I think that would be a perfect compliment. If you’ve got leftovers, just wrap them tightly in plastic wrap. This lemon pound cake will keep at room temperature for 4 days, in the fridge for a week, or in the freezer for a month. Browse more great cake recipes on my “Cake Recipes” Pinterest board! 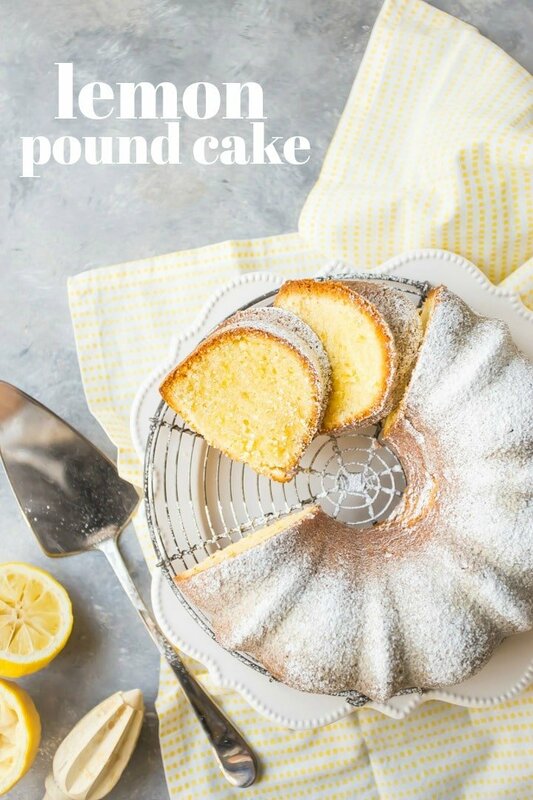 If you love lemon, you've gotta try this lemon pound cake recipe! Just bursting with tangy lemon flavor, and so moist! Made with all butter, for a velvety texture that practically melts in your mouth. Preheat the oven to 350 degrees F, generously mist a 10-cup bundt pan with non-stick spray, and dust with flour. In a large bowl with an electric mixer, cream the butter and sugar together on medium-high speed until pale and fluffy (about 5 minutes). Beat in the eggs, one at a time, until incorporated. Scrape the bottom and sides of the mixing bowl with a silicone spatula, then add the lemon extract, lemon zest, and lemon juice, mixing on medium speed until smooth. Add the flour and salt, mixing on medium speed until just barely incorporated. Transfer the batter to the prepared pan, and bake for 75 to 85 minutes, or until a bamboo skewer inserted in the thickest part of a cake comes out clean or with a few moist crumbs. Cool in the pan for 30 minutes, then invert onto a wire rack to cool completely. Thank you, thank you, thank you for not using that light green print! It’s almost impossible to read. The black is so much better. I’m looking forward to trying this cake for Easter. I enjoy your recipes very much. So happy you like it! Have a happy Easter! Hey Petra! Here in the U.S., it’s its own thing. I’ve updated the recipe card with an Amazon link, just so you can see what it looks like. It is slightly different in that it’s milled from harder wheat, so there’s less gluten. It’s also finer and lighter, so it yields a really nice result for cakes. If you can’t find it, you can sub all-purpose (aka: plain) flour, but I really prefer cake flour. I hope that’s helpful! Mmm this cake sounds great! I love lemon! Me too! So happy you like it Saba! Lemon desserts are my favorite – and this is so light and tender! I will make it. Thanks alot. But where is baking powder? There is no baking powder in this recipe. It’s a traditional pound cake, so the lift comes from creaming the butter and sugar together until they’re very airy and light. Hope you enjoy! I have the Nordic Ware formed aluminum bundt pan, and my whole cake stuck when I was trying to remove it. Any tricks to keeping it from sticking to the pan? Hey Brian! I am so sorry that happened to you. I have definitely been in the same boat in the past. You really have to grease the pan liberally, and dust it with plenty of flour. It’s also a good idea to flip it out of the pan while it’s still just a little bit warm. I hope that’s helpful! And I hope you have better luck next time! Great cake. I got a mixer and did this as my first time baking…. It turned out amazing. So moist, and tastes amazing. Great recipe. The only issue I had was my oven is apparently not even. When rising, it weren’t over on one side a bit. This is the first pound cake that I have ever made, probably because pound cake has always been dry and bland tasting to me…until now!! This cake is amazingly good and moist. I added fresh strawberries to the recipe as well and my entire family can’t stop raving. Thank you!! So glad it worked well for you Amy! I love that you added strawberries, how summery! Thank you so much for reading and for the positive feedback. Do you have the measurements in grams? 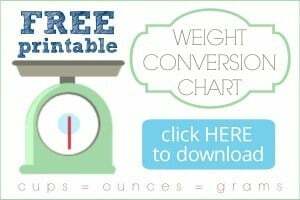 I have a printable weight conversion chart that I offer for free to all my readers! You can find the link in the right-hand sidebar. Enjoy! It is a lot! This cake is big- it serves 16 to 24 people. I’m preparing to make this cake and I realized that I don’t have kosher salt. Is regular table salt okay? Do I need to adjust the amount ? Hi Amia! For this small amount I don’t think it would matter too much. Hope you enjoy the lemon pound cake! 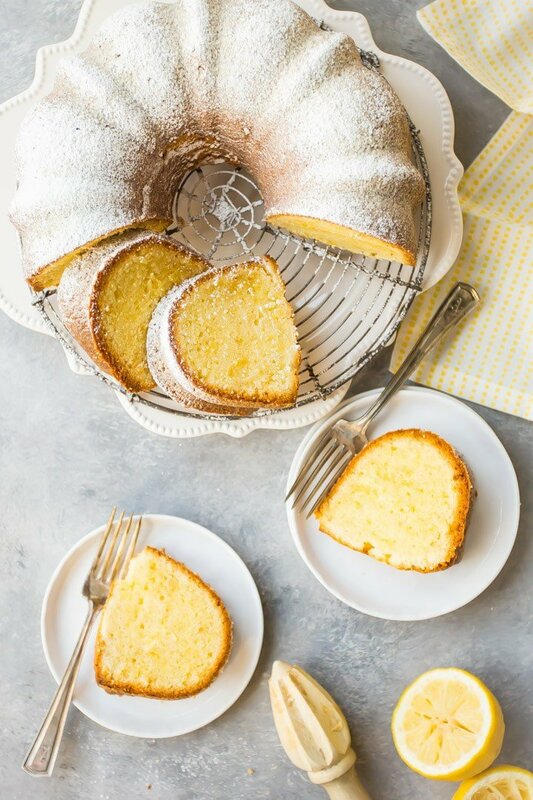 Can this be Keto lemon pound cake.? I’m not really familiar with Keto, sorry! If you sub the flour with almond flour and the sugar with stevia, you could make it keto, however, you might need to add baking powder for rise. Thanks so much for weighing in Ashley! Really appreciate your help with this! I need to make a pound cake in the traditional loaf pan. Have you done that with this recipe and does it make more than one loaf? Hey Judy! I have done it and it makes two loaves. Just keep an eye on the bake time, other than that you should be good! I made this cake, it turned out delicious, but it outside burned. Is the 350 degree temperature correct? I used oven thermometer to ensure correct temperature. Hey Jacqueline! I’m so sorry to hear that. Are you in the US? The correct baking temp is 350 degrees Fahrenheit. That’s a pretty standard temperature for baking cakes. Made this Sept. 19, 2018. I followed recipe exactly. I was concerned with using cake flour and there was no other liquid in recipe other than the lemon juice. I thought cake flour would make the texture too cake-y. THIS CAKE WAS FABULOUS!!! So moist, texture was just like a pound cake should be – dense but not so dense. Lemon extract + juice + zest made it just the right lemon taste. OMG….this recipe is a keeper. THANK YOU, THANK YOU, THANK YOU!!! So glad you were pleased with it Gina! Thank you for the positive feedback! How do you tell if it’s done? I baked it and all of my long sticks came out completely clean. But it fell while it was cooling and the inside wasn’t cooked. How can I tell so I can try this recipe again? Hey Kim! So sorry you had difficulty. The toothpick test is usually pretty accurate, but if the top of your cake is very crusty it might have scraped off the wet batter on the way out of the cake. Next time, try giving the top of the cake a gentle press. It should feel springy. And if you really want to be sure, you can take its temperature. An instant-read thermometer should register 210 degrees F. Hope that’s helpful! Hi SnackCake! You might want to check out the other comments on this post, to get an idea of what the flavor is like. A bundt pan has a 10-cup capacity, so if you want to bake it in another size pan, it should also be one with a 10-cup capacity. You may need to adjust the bake time though, since a bundt has a hole in the middle that allows heat to circulate better. Good luck! The lemon pound cake receipe lists lemon juice two times in the ingrediants section, but mentions lemon zest in the instructions. Is this a typo? Should one of the items in theingrediants read “lemon zest”? If so, which one? 2 Tbsp? Thanks for bringing it to my attention Sharon. It should have called for 2 tablespoons of zest, not juice. I have made the correction. I made this recipe, and followed it to the letter, yesterday, adding a couple of tips that I found from another website about how to get a pound cake with a truly fine crumb. I made sure that not only was my butter absolutely room temperature, but my eggs and lemons were as well. I submerged the eggs in warm water for about 10 minutes to make sure since the house was a bit chilly. I creamed the butter for about 2 minutes before adding the sugar in, and then creamed the butter and sugar for a full 8 minutes, stopping twice to scrap the bowl. Once the butter/sugar was incredibly fluffy, I made sure to incorporate the eggs slowly, just like the recipe states. I couldn’t believe how pretty and fluffy it all looked! I decided to use Swan’s Cake Flour instead of all purpose flour. I was rewarded with the fluffiest pound cake batter I think I have ever seen! The cooking times are spot on in this recipe…and when it was done. Oh my goodness. THIS is the pound cake of your dreams! It was just absolutely perfect. Moist and dense the way a pound cake should be…but with the most incredible light, fine crumbed texture you can imagine. My family of eight loved it…and true to your word, we each had a slice after dinner, with just the right amount to each have another slice for breakfast. I did add a glaze to the top of mine. I wanted to mimic the glaze thickness and texture of Starbuck’s Lemon Loaf. Do I used 3 cups of confectioner sugar, about 2-3 tbsp of fresh lemon juice, 2 tbsp of heavy cream and 2 drops of lemon extract. It was more than enough to produce a very creamy glaze that flowed down the cake just the right amount. I absolutely love your comment KB! So thrilled to hear that this recipe was such a smashing success for you. Thank you so much for the 5-star rating, and for sharing your glaze recipe! It sounds fantastic, I can’t wait to try making it that way. I’ve made this cake 2x in last month. Love it, but every time it starts to to burn last 20 min. I’ve been making pound cakes for over 30 years, but I’m stumped. Any thoughts. So happy you like the cake Tiffany! I’m wondering if it might have something to do with the pan you’re using? Just because I happened to be baking mini-muffins over the weekend. I have 3 different mini-muffin pans, and I notice that even though they’re all filled with the same batter and baked on the same oven rack at the same temperature for the same amount of time, some of them bake up really brown and some come out pale. Even though they’re all the same done-ness on the inside! Have you tried using another bundt pan? I wonder if you might have different results. Another possibility could be that your oven just runs a bit hot. You can buy one of those little oven thermometers for just a few dollars, and hook it on one of the racks to see if the temp is accurate. If not, just adjust accordingly. It’s amazing how far ovens can wander out of calibration over time! Congrats on your new mixer! So happy the recipe worked well for you, even if you did lose a little over the side of the pan, lol! First time in several hundred cakes that a recipe totally failed. Cake wouldn‘t come out of the form, was burned on top and still uncooked inside, although I followed the recipe closely. Looks to me like there is too much butter – have never seen that much butter in a cake. Could it be that there is spelling error and the right quantity would be 1 1/2 cups?? Sorry to hear you had trouble. The amounts stated are correct- it’s a large cake (serves 16-20; 10 baked in a 10-cup pan), and it’s a pound cake so the ratios are standard for this type of cake. I’ve made it successfully numerous times, one of which was on camera and can be viewed on this post. There are also a lot of comments from other bakers here who have had success with the recipe as written. It can be tricky to get out of the pan, so you really need to grease it well and flour it generously. If it is browning too quickly, it may be because your oven runs a little hot (this is not uncommon). You might want to lower the temperature to compensate for that, and extend the bake time as needed.